The Revere bowl has been part of American history since its original design named the Liberty Bowl. Saxton’s style of Revere bowls are all made in our Glendale, CA facility and spun using the highest quality Solid Jewelers Bronze. 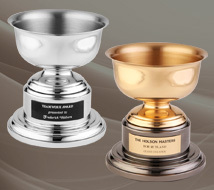 Buffed and Polished to a spectacular finish, these Revere Bowls speak for themselves and are perfect for Corporate Awards, Recognition Awards, Sports Awards and much more! Engraving is available! All items in this section are made of solid jewelers bronze and Made in the U.S.A. All items are coated with clear baked enamel to avoid tarnish. Available in refers to color only, not material.